I am going to just go ahead and say it. Overcooked is one of the best couch co-op games I have ever played in my 23 years existing on this planet. Yes I know I am a little late into picking this game up and reviewing it, but I just recently traded in my Ps4 for an Xbox one and I wanted to sit down and actually beat the game before I reviewed it. Well here goes nothing. 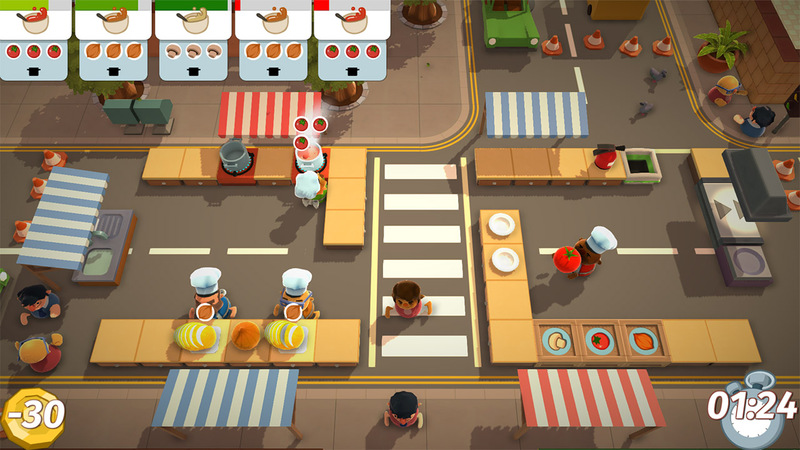 Overcooked is a cooking simulation game from a top view camera. The basis of the game is to cook the ingredients as fast as you can. Now I know it sounds easy, but trust me when I say holy hell it is not! My fiancee and I were playing the game. It took us about 3 days to pass the base game. The reason I say base game, is because overcooked does have DLC which we have yet to play. Anyway, the controls are pretty easy, you pick up things with the A button, chop with the X button, move around using the left analog stick, and dash with the B button. Very basic controls, but not a basic game. Even after you master the controls, you still have to master the levels as well as master communication between you and your couch co-op buddy. Now I know some of you are wondering what do you even do in this game. Well like is said in my previous paragraph all you have to do is cook (I am not kidding that is all you have to do), but you have to grab the ingredients from the boxes that are located around the levels, put the ingredient on the cutting board and mash that X button like crazy. Once you are done chopping up the ingredient, you either have to put it in a pan or pot that way it can cook, just make sure to not overcook it because if you do, you will catch the whole kitchen on fire (which I did one time). Once the ingredient is ready, you put it on a plate and you serve the dish. Now that I explained it a little bit more thorough, sounds easy right? No, it is not easy what so ever. You can either play the campaign by yourself, the only thing is that you are going to have to control 2 chefs at he same time meaning you have to use both analog sticks to make sure you don’t overcook your food. This game is meant to be played with 4 players, if you don’t have a 4th player than 3 players is fine, if not than 2 players is just right. Overcooked is a very fast pace game that will keep you on the edge of your seat the entire time you are playing. Some levels have you in space, other levels have you on ice where one false move can have you slipping off the level and waiting 5 seconds before you can respawn and help out your buddy finish the meal. Now lets say that one of your friends starts talking smack to you saying that he is the better chef, you aren’t going to settle it in Smash, you are going to settle it in the kitchen! Overcooked comes with a versus mode. The versus mode has you doing the same thing you would do in the campaign, but instead of teaming up, you’re going head to head. You unlock new versus levels not by buying them through DLC, which by the way thank you Ghost Town for that, but by playing the campaign. 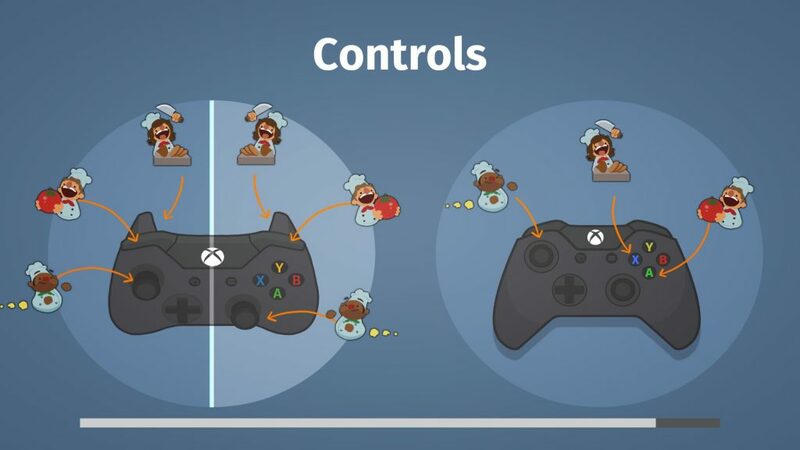 If you are going to play the versus mode, I suggest you apologize to your friends right after because I am telling you, Overcooked is going to cause a lot of problems. Now this game has hardly any bad in it, mainly good. The only things that i can nitpick and complain about are some of the glitches that this game comes with. In one of the levels you have to use conveyor belts to pass the food back to one another that way you can make the plates. I put a tomato on the conveyor belt and before my fiancee could get to it, for some reason the tomato started to float into the air for no reason causing us to lose a plate. Sometimes the game does bug out, but other than that, I have no other complaints. You can replay levels over and over again to try and master them and beat your high score. Overcooked is a must buy game! You will be having a blast with your friends. You will be laughing, screaming, and crying (the crying is part is because your friends are going to be screaming at you). Overcooked is great for playing with friends and family members of all ages. Now I don’t want to spoil or ruin the game for you, so I hope you enjoyed this review and if you have any comments please feel free to let us know. Have a great day chefs!